Bedside Commode with Padded Arms - Steel Drop Arm . 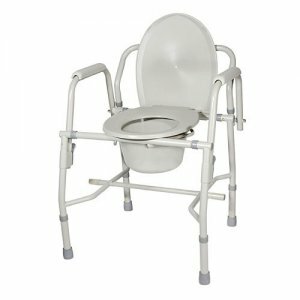 The deluxe steel drop arm bedside commode by Drive Medical is designed to meet your needs. The frame can be configured to be used as a bedside commode, toilet safety frame, elevated toilet seat or over your existing toilet. The tool free removable back makes configuring the commode easy for any application. The armrests provide a comfortable place to rest on when sitting and indicate a safe place to grab making sitting and standing easier. For consumers using a wheelchair the tool free drop arms makes lateral transfer to and from this commode easy and safe. The drop arms feature a large, easy to push release lever which is great for users with limited finger or hand dexterity. The push button height adjustable legs makes sizing a breeze allowing this commode to be used as an elevated toilet seat. In addition to comfort this commode can be disassembled with out tools making storage and travel convenient. 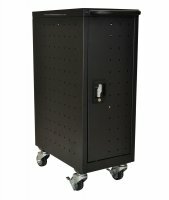 The grey power coated steel welded construction ensures strength and durability able to hold up to 300 lbs. The product comes complete with a snap on seat and lid, 12-quart commode bucket with cover and convenient carry handle, plus splash guard. The product is protected by a limited lifetime warranty. Width (between arms): 17.5"; Outside Width: 24"; Seat (Width): 13.5"; Seat (Depth): 16.5"; Height: 19"-23"; Product Weight: 18.1 lbs.